Since the development of the CT scanner, clinicians have been interested in visualizing the beating heart. 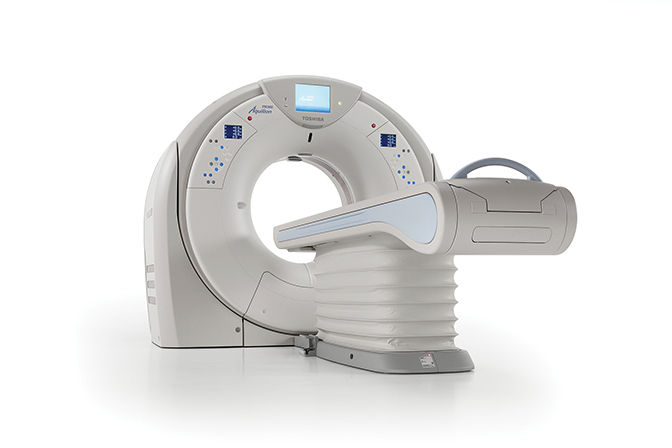 With the introduction of the multidetector CT (MDCT), this possibility became a reality. Today’s modern scanners—boasting from 64 to 320 detectors—are capable of generating sub-millimeter slices with gantry rotation times as low as 0.25 secs, collimation as narrow as 0.24 mm, and reconstruction times as fast as 0.020 secs or shorter. Many systems can image the heart in a single gantry rotation and enable free-breathing CTA exams. This year, the Society of Cardiovascular Computed Tomography (SCCT) holds its 10th Annual Scientific Meeting. One of the most important contributions SCCT has made is to embrace a multi-disciplinary approach to cardiac imaging by promoting collaboration between radiologists and cardiologists, says SCCT President Ricardo C. Cury, MD, FAHA, FSCCT, FACC, Chairman of Radiology and Director of Cardiac Imaging at Baptist Health of South Florida,. In addition to fostering collaboration among specialties, the Society is also keenly focused on international expansion. Dr. Cury believes that, with 13 international chapters, being a truly global society is one key to SCCT’s continued growth and success. Right now, Dr. Cury says, the clinical evidence and practice guidelines all point to a significant opportunity for CT angiography (CTA) to evaluate patients with chest pain in the emergency department (ED). What is missing, he adds, is clinical implementation. “There has been successful implementation at several sites, but many more need to take action,” says Dr. Cury, who advises facilities seeking to implement CTA in the ED to begin by creating a multidisciplinary team. “Involve the key stakeholders—ER physicians, cardiologists, and radiologists. It may be challenging, but it is the ideal scenario,” he says. Next, develop a clinical pathway to stratify coronary events. Patients at low-to-intermediate risk of ACS don’t need further imaging beyond a diagnostic CTA, yet those with chest pain, positive cardiac enzymes and/or EKG changes (eg, ST elevations) should be admitted for further clinical testing or intervention, he says. As far as implementing a cardiac CT program, there are three important considerations, says Steven D. Wolff, MD, PhD, FACR, Director of Carnegie Hill Radiology and Associate Director of Cardiac CT and MRI Education at Lenox Hill Hospital. First, obtain the proper training at facilities that have a program in place or attend hands-on training courses. Second, invest in and train technologists; this is important no matter the modality, he adds. Third, develop good relationships with and educate referring physicians on what they need to know regarding cardiac CT imaging. Today at Carnegie Hill Radiology, 90% of the practices’ CT studies are cardiac. In cardiac CTA, clinicians want the lumen to be as bright as possible. Jeffrey C. Hellinger, MD, MBA, FACC, a radiologist at Lenox Hill Radiology, suggests achieving this by using high-concentration contrast media, which involve higher levels of iodine. “It’s not necessarily the volume of contrast, but the amount of iodine that affects vessel attenuation and imaging in high-contrast applications such as CTA,” Dr. Hellinger says. As a result, higher concentrations of iodine may enable clinicians to use lower volumes of contrast. This is important in patients with decreased renal function. Yet, there’s another benefit that Dr. Hellinger has uncovered in his practice. “If I can achieve high-density imaging by delivering high concentration (of iodine) in the lumen during CTA, then I have the opportunity to lower the radiation dose—I’m not as dependent on higher radiation levels for differential attenuation and acceptable image quality,” he says. Since Dr. Hellinger was able to achieve 1,000 to 1,200 Hounsfield Units (HU) with the high-concentration contrast media, he started progressively lowering the kVp and mA while evaluating image quality. From this process, Dr. Hellinger discovered that he could achieve excellent image quality in select patients at 80 kVp and, more recently, at 70 kVp using high concentration contrast media. While clinical studies have demonstrated the clinical utility of CT for evaluating patients with coronary disease, improvements are still needed in a few areas. The problem of blooming artifacts caused by calcified plaque is one of the most significant unmet needs facing CTA, says Dr. Wolff. 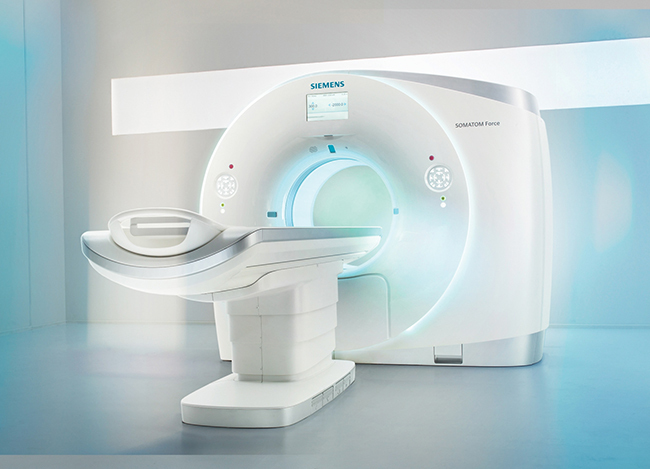 Dual energy, also known as spectral imaging, can help address the challenge of blooming artifacts, says Christine Ziemba-Landon, CT Product Manager, Siemens Healthcare. Additionally, dual energy has also been shown to reduce beam hardening, which can also lead to overestimation of coronary artery calcium, she adds. There have also been some initial investigations using dual energy CT to help clinicians see in and around plaque, potentially to assist in the evaluation of in-stent restenosis. Dr. Cury also sees a potential role for dual energy CT to reduce the amount of contrast used in the study. “Initial studies have shown that we can give significantly less contrast in a coronary CTA, with 25-30 ml of contrast compared to 60 to 80 ml, by using dual energy CT,” he explains. This is, of course, an important consideration when imaging patients with renal dysfunction, he adds. Toshiba America Medical Systems continues to work on CT perfusion, says Tim Nicholson, senior manager, market development, in the TAMS CT Business Unit. The goal is for clinicians to perform both anatomical and physiological, or functional, imaging such as CT perfusion on the same system—a one-stop shop approach to cardiac CT. While dose was an issue with CT perfusion, Nicholson says that now, with iterative reconstruction (IR), clinicians can reduce dose and acquire the data in a single rotation. Initial studies of CT FFR also show promise for calculating flow dynamics. In the NXT Trial, the authors found that FFR CT “provides high diagnostic accuracy and discrimination for the diagnosis of hemodynamically significant CAD with invasive FFR as the reference standard. When compared with anatomic testing by using coronary CTA, FFR CT led to a marked increase in specificity and positive predictive value.”3 While the technology appears promising (HeartFlow, HeartFlow Inc.), Dr. Cury says the key disadvantage is the delay in diagnosis: Currently the images must be sent to the manufacturer for analysis. For the technique to become more widely adopted, Dr. Cury says, the calculation of CT FFR ideally will need to take place on the clinicians’ workstations so it does not impede workflow. Cardiac MR (CMR) is another potential tool for functional cardiac imaging, says Dr. Wolff. While improvements have been made in CMR, there remains a need for faster acquisitions. “Faster protocols for imaging the heart would make CMR better accepted in terms of making the data easier to obtain,” he adds. Although MR manufacturers continue to address this issue, Dr. Wolff says one company—Heart Vista—has advanced MRI applications that provide for faster imaging of the heart. Evaluating patients with mitral valve regurgitation is another area where MRI could play an important role. Dr. Wolff and colleagues recently published a study that found that MR was more accurate than echocardiography in determining the severity of this disease. “In this study, we found that 70% of the patients who underwent surgery didn’t have severe mitral regurgitation, and therefore may not have required the surgery,” Dr. Wolff says. Using conservative estimates of costs, he adds that MRI, at an estimated cost of several hundred dollars, could have saved many of these patients and the healthcare system more than $30,000 in surgical costs alone. Cardiac patients today are sicker than in the past, says Ziemba-Landon; therefore, the ability to perform free breathing cardiac CT is in high demand. This is increasingly important when evaluating patients with a known or suspected pulmonary embolism. Sub-second imaging and single beat cardiac imaging are also important capabilities that many clinicians want in CTA. “Imaging implantable devices is a key area where sub-second and high, native, temporal resolution imaging are important,” Ziemba-Landon adds. She notes that the SOMATOM Force, one of Siemens’ newest CT scanners and a dual source, dual energy solution, provides 66 ms temporal resolution, the ability to lower kV in increments of 10 (from 70-150 kV) and a gantry rotation speed of 0.25 secs. With Toshiba’s Aquilion PRIME, Nicholson says, physicians can achieve 0.5 mm slices with the 80-detector configuration, which is also field upgradeable to 160 slices. Nicholson also sees continued opportunities for CTA to help lower the cost of healthcare. “With the new value-based payment models, providers are being mandated to lower costs and improve outcomes. Cardiac CT can do that—it can be the right test at the right time,” he says. Cury RC, Feuchtner GM, Batlle JC, et al. 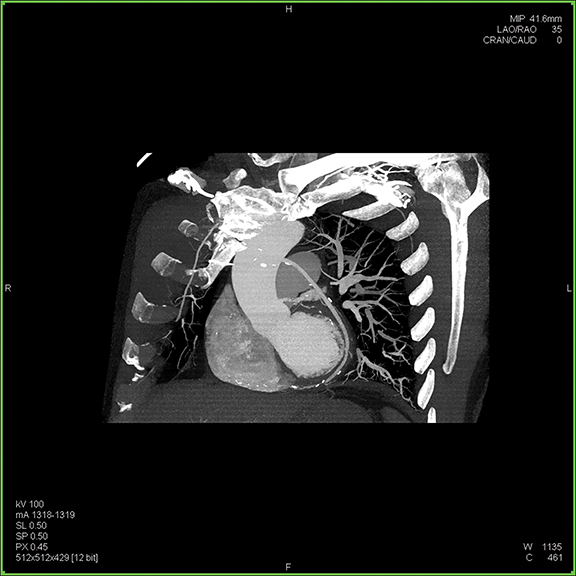 Triage of patients presenting with chest pain to the emergency department: implementation of coronary CT angiography in a large urban health care system. Am J Roentgenol. 2013;200(1):57-65. Cury RC, Kitt TM, Feaheny K, et al. A randomized, multicenter, multivendor study of myocardial perfusion imaging with regadenoson CT perfusion vs single photon emission CT. J Cardiovasc CT. March-April 2015; 9(2):103-112.e2. Norgaard BL, Leipsic J, Gaur S, et al. Diagnostic performance of noninvasive fractional flow reserve derived from coronary computed tomography angiography in suspected coronary artery disease. The NXT Trial (Analysis of Coronary Blood Flow Using CT Angiography: Next Steps). JACC. April 2014; 63(12):1145-1155. 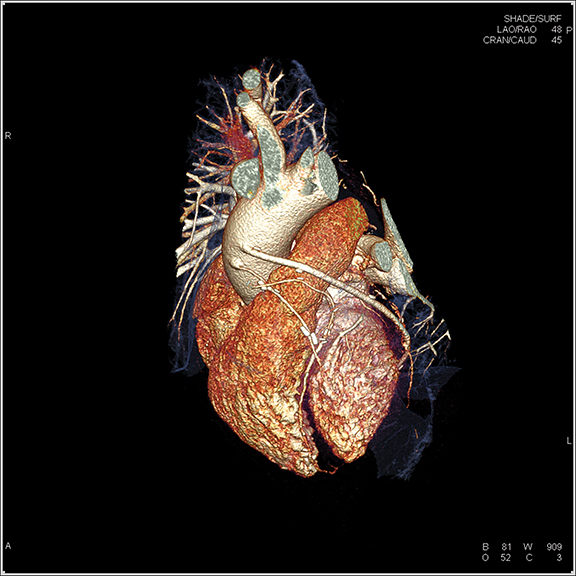 Technology Trends: Cardiovascular Imaging — The beat of progress goes on. Appl Radiol.